Most of the new units will operate along the forthcoming Mid-Coast Trolley expansion. 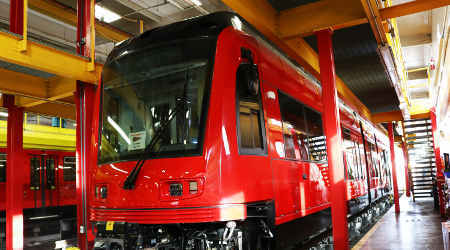 The San Diego Metropolitan Transit System (SDMTS) has received the first light-rail car from Siemens as part of a 45-unit order placed in 2016. Siemens late last week delivered the first unit to the agency's downtown rail yard, with the remaining vehicles slated to arrive over the next two years, SDMTS officials said in a press release. The new S70 rail cars will enable the agency to increase service frequency on its existing UC San Diego Blue, Sycuan Green and Orange lines. Additional trains also will used on the Mid-Coast Trolley line, which is an 11-mile extension of the UC San Diego Blue Line scheduled to open in 2021. SDMTS will use 36 of the new 45 new cars on the Mid-Coast Trolley extension. The units feature the same low-floor design as SDMTS' current fleet, along with a redesigned middle section aimed at improving passenger flow and providing better accessibility for riders in wheelchairs. Siemens has relocated the units' operational equipment to make maintenance easier, according to the agency. Siemens has provided light-rail vehicles to SDMTS since the launch of its initial trolley service in 1981. "These vehicles represent the true partnership that exists between [SDMTS] and Siemens," said SDMTS Chief Executive Officer Paul Jablonski. "We worked closely over the last two years to ensure that these vehicles meet the needs of our system — and our riders — once Mid-Coast becomes operational." In fall 2016, the San Diego Association of Governments tapped a joint venture of Skanska, Herzog and Stacy and Witbeck Inc. to serve as construction manager and general contractor for the Mid-Coast Trolley project.